October 20th 2016 is the first international World Values Day. And it is a good time to talk about values. Despite calls to keep calm and carry on, we have a more uncertain time for UK business and markets, with Brexit in prospect, than any since the oil price shocks of the 1970s. It feels like the old story about a man and a horse. To date, Brexit has been treated as a political decision – a complex, technical challenge for negotiation and a high risk period of adjustment. The deeper question, and one that can start to root us and allow us to act with purpose, is what country we want to live in, what nation or nations do we want to be part of. What, in short, are our values? The USA talks about the American Dream. The UK appears quietly proud of being neither a dreamer nor, as one of the few nations in the world without a written constitution, a draftsman. The success of devolution in recent years means too that the UK is a complex and perhaps fragile assembly of nations, not as united a kingdom as our name suggests. The UK is often characterised by a sense of tolerance, fair play and support for the underdog – values perhaps that will never make for footballing greatness, even if we can certainly shine with sporting prowess in the more eccentric diversity of the Olympics. The UK government has had, since 2011, a definition of “fundamental British values”, which are those of democracy, the rule of law, individual liberty, and mutual respect and tolerance of those with different faiths and beliefs. This encapsulation first appeared in 2011 alongside the government’s ‘Prevent’ strategy, designed to stop people being drawn into terrorism. Schools are now asked to promote these British core values, but they have had little success so far. A survey of secondary school children published last month showed that they were far more likely to choose ‘fish and chips’, ‘drinking tea’ and ‘celebrating the Queen’s birthday’. In a culturally diverse society, the concept of core British values, beloved perhaps of politicians, meant little or nothing to them, in contrast to ideas of Christian, or Muslim or humanitarian values. However, there is recent research from a dedicated non-profit, the Common Cause Foundation that offers a rich profile of the values in practice that people in the UK have. What emerges overall is that the UK has strong and positive values, but also, that this is not the story that we tell ourselves. The Common Cause report suggests that 74% of people (higher for women, higher for men and women in Wales and Northern Ireland, lower in London) tend to put values of compassion above values of self-interest. Compassionate values include ‘broadmindedness’, ‘a world of beauty’, ‘a world at peace’, ‘equality’, ‘protecting the environment’, ‘helpfulness’, ‘forgiveness’, ‘honesty’ and ‘responsibility’. Values of self-interest include values of ‘wealth’, ‘social recognition’, ‘social status’, ‘authority’, ‘control’, ‘popularity’, ‘influence’ and ‘ambition’. But when it comes to their perception of other people and the values they hold, the reverse holds true – others are seen, unfairly perhaps, as putting self-interest higher than compassion. We risk as a result becoming a nation of private integrity, but public suspicion. The Common Cause team point the finger at politicians, media and economists who spread the message that most other people are out for themselves. The story that we tell of our values as a nation is upside down, whereas the reality is far more hopeful. So, if this is a time of great uncertainty, not just Brexit as we could add in environmental risk, climate change and migration into the picture, with the horse cantering off to we don’t know where, then it is not just the right time but an urgent task to start more of a national conversation on values. We have precedents. The philosopher and writer Iris Murdoch helped in the 1990s to pioneer public dialogue around some of the ethical challenges around new genetic technologies. That has now become a world-renowned programme of public engagement, Sciencewise, led by agencies such as Involve, that has helped the UK to develop the most forward thinking policy framework for new technologies, from genetics and nanotechnology to new challenges such as machine learning. Further back, of course, questions of values are central to theatre, literature and art. The tussle between values and money, for example, is a timeless concern. For children, there are the spoilt brats in English, overindulged or overprivileged, like Veruca Salt in Charlie and the Chocolate Factory. In the Netherlands, there is the equivalent term verwend nest, although, curiously, it applies to girls alone. In France, there are the enfants gâtés, the generation post Second World War that never had it so good. But we can all be ‘spoiled’. The fear that any of us puts possessions above people or money before God is something that each of the great faith traditions talks about, each with its own, enduring framework of insight and reflection to offer. Values are what make us who we are. They are the compass guiding everything we do – our choices and our actions. When we forget that compass, we take the wrong turn. It’s the same for us as individuals, as a nation and as a world. It is time to talk values. I am delighted to be launching my new book, Values: how to bring values to life in your business on World Values Day. And, for family values, I’m also happy to say that the illustrations are by Frankie Mayo. Workers and consumers on boards? The proposal by the Prime Minister to have consumer and possibly worker representatives on the boards of British companies has had a fascinating reception. If it were a leftist suggestion, then it can be pigeonholed as an attack on the interests of investors. But it is not. It is an idea that has emerged as one of the ways in which markets can survive and thrive in an era of inequality. In some quarters, the response has been silence, disbelief. In others, a hope that it goes away. I don’t believe that it needs to. In the co-operative sector, we have ample experience of what to do and what not to do, the tips and the hints and the disciplines needed to make this work. At its heart, the power of the model is that you have independent non-executive directors, but they are independently informed about a key element of company culture and performance, rather than, as at present, largely independently ignorant – and reliant on flows of information from the centre. At present, corporate governance as an information system, is still top down, centrally controlled. Of course, you need some control and sufficient coherence, but the alternative model is what the great Shann Turnbull calls ‘cybernetic governance’ drawi information from multiple stakeholders. 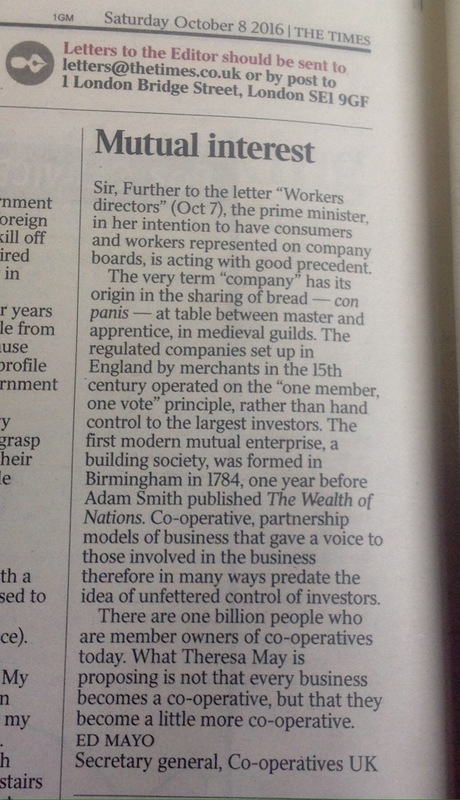 I have published a longer piece on the Prime Minister’s interest in mutuality on Huffington Post and today had a letter on the origins of all this, published in The Times. Do it with care, but yes…bring it on! 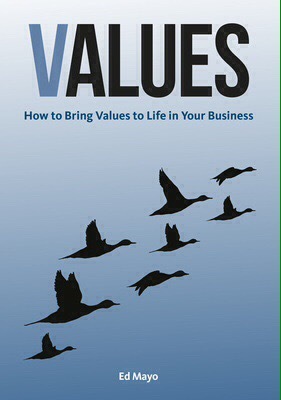 My book Values on values in business is out soon, published by Greenleaf. The book focused on practical tools to bring values to life in an organisational setting and it is for all businesses. But looking back, I can also see that the history of the co-operative sector that I am in is a history of innovation on the basis of values. Here are seven that I think stand out. From the beginnings, in the 1840s, one member, one vote rule also applied to women – at a time when women were not normally allowed to own property or vote. Only in the 1920s, 70 years later, were women allowed to vote in the UK. In 1854, Friedrich Raiffeisen decided to take on what he described as the “vampire” loan sharks, Credit unions now provide a genuine people’s bank for over 186 million people in 97 countries. The Coop Crumpsall Biscuit Factory became the first only 8 hour day works in Britain when it introduced limited working hours in 1901. Nearly a century ahead of its time, it wasn’t until 1998 that working hours in the UK were limited to 48 hours. Mondragon, now the world’s largest worker co-operative, with the slogan of humanity at work, was founded in 1956 in Basque Spain. Every member, ultimately, has an equal vote. In 1980, with oil prices rising, three families in Ny Solbjerg near Aarhus – the Lauritsens, Vangkildes and Sorensens – decided to form a co-op to install a 55kW wind turbine. Within two decades, co-operatives like theirs had made Denmark a world leader in renewable energy. In 1988, coffee farmers in Oaxaca, Mexico joined together in the co-operative UCIRI (Union de Comunidades Indígenas de la Región del Istmo) to launch the first ever certified fairtrade product, sold to consumers in the Netherlands under the label of Max Havelaar. Today, three quarters of all fair trade is produced by co-ops. In 2001, workers in Argentina took over failed businesses as unemployment soared. When Argentina defaulted on its debts, unemployment rocketed to one in four of the population. As companies collapsed, workers responded by occupying factories and continuing to trade in the new form of worker co-operatives. 170 businesses, some with over 200 employees, were rescued in this way by their workers and 93% of these are still operating. Values are how you see the world and values can inspire you to change it.